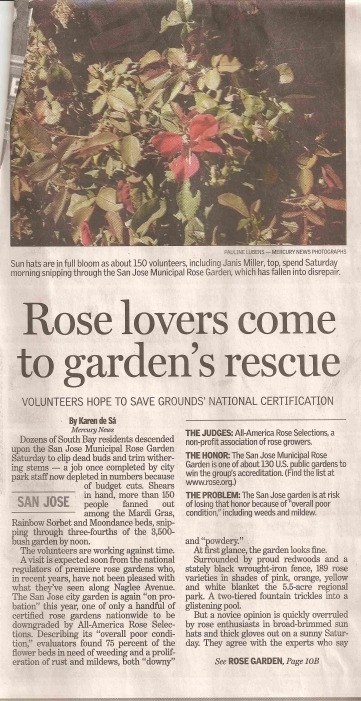 Dozens of South Bay residents descended upon the San Jose Municipal Rose Garden Saturday to clip dead buds and trim withering stems — a job once completed by city park staff now depleted in numbers because of budget cuts. Shears in hand, more than 150 people fanned out among the Mardi Gras, Rainbow Sorbet and Moondance beds, snipping through three-fourths of the 3,500-bush garden by noon. The volunteers are working against time. At first glance, the garden looks fine. Surrounded by proud redwoods and a stately black wrought-iron fence, 189 rose varieties in shades of pink, orange, yellow and white blanket the 5.5-acre regional park. A two-tiered fountain trickles into a glistening pool. But a novice opinion is quickly overruled by rose enthusiasts in broad-brimmed sun hats and thick gloves out on a sunny Saturday. They agree with the experts who say one of the city’s two main rose gardens has fallen into disrepair. In what is supposed to be a showcase bed of 1998 “Dream Come True” roses, for example, there’s little to be seen but scraggly sticks dotted with yellow-splotched leaves. 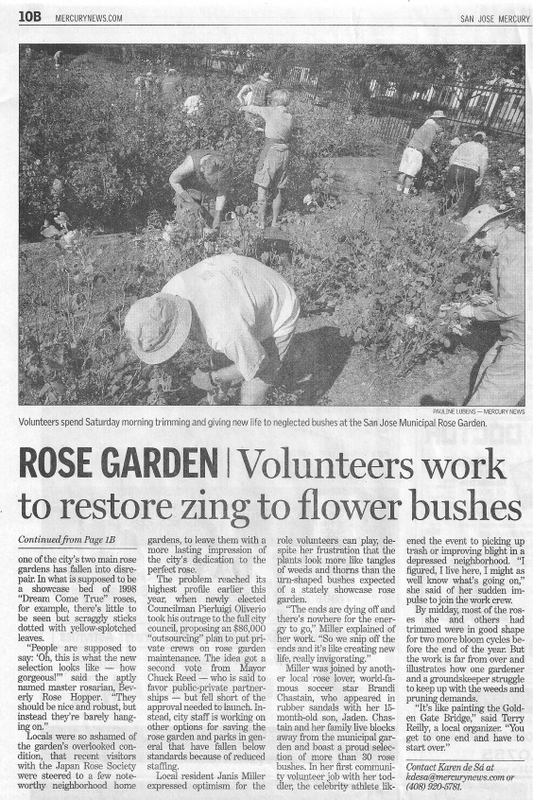 Locals were so ashamed of the garden’s overlooked condition, that recent visitors with the Japan Rose Society were steered to a few noteworthy neighborhood home gardens, to leave them with a more lasting impression of the city’s dedication to the perfect rose. The problem reached its highest profile earlier this year, when newly elected Councilman Pierluigi Oliverio took his outrage to the full city council, proposing an $86,000 “outsourcing” plan to put private crews on rose garden maintenance. The idea got a second vote from Mayor Chuck Reed — who is said to favor public-private partnerships — but fell short of the approval needed to launch. Instead, city staff is working on other options for saving the rose garden and parks in general that have fallen below standards because of reduced staffing. Local resident Janis Miller expressed optimism for the role volunteers can play, despite her frustration that the plants look more like tangles of weeds and thorns than the urn-shaped bushes expected of a stately showcase rose garden. Miller was joined by another local rose lover, world-famous soccer star Brandi Chastain, who appeared in rubber sandals with her 15-month-old son, Jaden. Chastain and her family live blocks away from the municipal garden and boast a proud selection of more than 30 rose bushes. In her first community volunteer job with her toddler, the celebrity athlete likened the event to picking up trash or improving blight in a depressed neighborhood. “I figured, I live here, I might as well know what’s going on,” she said of her sudden impulse to join the work crew. By midday, most of the roses she and others had trimmed were in good shape for two more bloom cycles before the end of the year. But the work is far from over and illustrates how one gardener and a groundskeeper struggle to keep up with the weeds and pruning demands. “It’s like painting the Golden Gate Bridge,” said Terry Reilly, a local organizer. “You get to one end and have to start over.” – BYLINE: Karen de Sa, San Jose Mercury News, Calif.